Gram takes Sam to the shelter to pick a pup. How will Sam know what pup to pick? PICK A PUP is a dictionary of types of puppies for Sam to pick – psychological types, that is. No references are made to breeds, just behaviors – “mostly-sound-asleep,” “teeny-weeny,” “woolly-like-a-sheep,” etc. Tongue-teasing words make it fun to read and fun to hear. In the end, Sam gets his pup, and it becomes easy to see why the picking is easy as can be. So, you have picked your pet or you are planning to pick a pet. Let’s think more about the things a child can learn from a pet. See Kids and Pets: The Basics (link) for information about picking pets. Read below to think about this chance to help your child learn about responsibility, love, independence, and loss. Nine out of 10 kids have pets according to Dr. Melson, author of WHY THE WILD THINGS ARE: ANIMALS IN THE LIVES OF CHILDREN. If you are bringing a pet into a family that already includes a child, you will need to decide what pet responsibilities the child is ready for. Be sure to consider both the child’s skills (what he can do on is own) and his maturity (how well he stays on task and does what is expected of him). Different children will be ready at different ages (“When Are Kids Old Enough?”). Once you assign a responsibility, be sure to watch to see if he is doing it as expected. If not, it is better to remove the responsibility for a few more months rather than nag at him to do his pet chores or worse yet – do them for him. If he has to give up a pet chore, try giving him another household chore to replace it – something that will help you out so you have time to take over his pet duty (for example, taking clothes to the laundry, dusting table tops, etc.). Darling Daughter: That is what we did – I resisted the urge to nag, nag, nag and just took back Ezzy’s responsibility (of feeding the hermit crabs every other day). Now she’s moved on to desiring a cat or a little fluffy dog. The last time E asked (for the thousandth time) when we could get a cat … (or a dog) I casually pointed out that she was not feeding the crabs so I wouldn’t consider anything else. I expected to see her run right to the kitchen and feed the crabs as a knee jerk reaction but that was not the case. It put a quick end to the discussion, and it hasn’t come up again. This is telling me she understands that she is not ready. The key in this situation is – wait to get a pet until your child is ready to take on at least some of the responsibility. And, let your child know that is what you are waiting for. Give him ways to show you he is ready to be responsible – before you take that trip to the shelter or pet store. We used self care as the indicator. E knew that she had to be able to take care of herself (brushing teeth, for example) without being reminded every morning and night. An invisible responsibility is one that an adult has but never really lets a child know about it. Does your child really know all that adults do to provide him with a cozy room, clean clothes in his drawers, a comfortable, warm house, fun summer vacations? Too many of us keep our families running smoothly without ever explaining or showing the effort it takes on our part. We don’t make the responsibility we take on clear to our children. 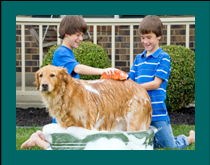 Let your child know what the steps are to meeting each pet responsibility – how a cage is cleaned, how often and what kind of exercise is needed, etc. Don’t allow the pet to be all fun for the child with no awareness of the work involved. And, by the way, it is OK to show our children that our responsibilities are sometimes hard to meet. There are days we just don’t want to do our chores. But, we do. We know our responsibilities are important, and there are bad consequences, if we don’t follow through. This is an important lesson for children to learn. Talk about how hard it is to take care of a pet – but, don’t forget to talk about what you like about having a pet as well. Pets show that they like their caregivers. For children, this means a lot of “I like you.” and “I want to be with you.” types of messages. Pets give attention to the child enthusiastically. And, regardless of mistakes the child may make – pulling a tail, forgetting a meal, or showing up late – he can still depend on being accepted by the pet. This is comforting for the child. We call it unconditional love or no-strings-attached love. What many people do not quite understand is that being able to count on this love makes children better at learning new skills and following life’s rules (“Love Your Kids No Matter What, Part 2“). The “soft “ parts of caring for children really are connected to and important to the necessary learning and discipline parts of raising a child. Pets give children a chance to learn more about both giving and getting love with no strings attached. Make comments when the pet shows the child attention or affection – how great it feels, how often it happens, how the child can always count on it. Likewise, make comments when the child is the one showing attention or affection to the pet – how great that the child knows how to do just what the pet likes, how people do that for the people they love as well. Not sure hermit crabs were the way to go for the unconditional love aspect of pet ownership. Hand-in-hand with this love with no strings attached is the development of empathy, which I have talked about many times in this blog (“Bullying”). Empathy leads to a child having higher self-esteem, being more respectful of others, and treating others more fairly. It is interesting to note that bullies do not have much empathy. That means to me that a child who develops empathy will less likely be a bully. Caregiving is a way children can develop empathy. 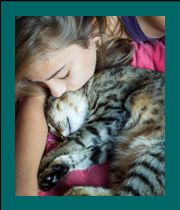 Pets provide practice in caregiving – something children don’t get much practice doing in today’s world. We aren’t as quick as in days gone by to give kids responsibility for younger brothers and sisters. Boys especially don’t get much chance to be caregivers because too often adults do not encourage them to play with toys like dolls, cooking, housekeeping tools, etc. Children usually expect to be able to control a pet. They want the pet to do what they want it to do when they want it to do it. They quickly learn that the pet has a mind of its own. This is a good time to talk to children about how thinking for oneself is a good thing – everybody has likes and dislikes. However, both people and pets have to follow house rules. That’s why we train our pets to be quiet and not make messes. It can be hard for children to realize that some pets will also have a favorite person in the household. It may not be the child; it could be an adult, especially if the pet was in the family before the child. Or, if there are several children, one may become more the pet’s favorite than another child. This happened in our family on day one of Sandy’s (toy poodle) arrival. We introduced her to both daughters by having them sit on the floor and stretch their legs out until their feet touched sole-to-sole. We put the dog in the corral their legs created. At that moment, the dog went directly to Darling Daughter and always preferred her from that day forward. Helping children accept this independence on the part of the pet is an important life lesson. At our house, Lovely Lil Sis quickly saw that Sandy loved her as well and had loads of fun with her – even though she slept every night with Darling Daughter. In addition, Darling Daughter learned right away that being the favorite meant more of the responsibilities. She was the one who was “picked” for feeding and walking duties most of the time. People can be sad some of the time and still find things to be happy about at other times. Protecting children from sadness can be a form of overindulgence. Too often the loss of a pet is a situation where sadness is covered up with an immediate trip to a shelter or a pet store. That was hard in our house. We didn’t go running to the shelter for a replacement but E was only 3 when our greyhounds passed and she would occasionally ask when they were coming back. It was every other week or so. I swear she really believed they were coming back but then when we would have the “they are not coming back” conversation she didn’t seem shocked or upset. Children at that age do not “get it” that death is forever. I suspect when you would tell her they weren’t coming back that still just meant “not now” to her. She couldn’t be upset about an idea that her brain was not able to understand. Remember that your job as a parent is to help your child get through developmental tasks and grow from them. Experiencing loss is a developmental task – to learn how to deal with missing someone or something you care about. Ask yourself honestly whether you have given your child time and opportunity to do this developmental task. Wait to replace a pet until you can honestly answer that question with a yes.